The temporary exhibition “Paesi Di Calabria, Dwelling Cultures Now And Then”, presented by the organizations Club Sannnicolese, Comunità di Filogaso and Mammola Social Club in Toronto, Ontario – Canada, is a project sponsored by Region Calabria through the Regional Decree 54/2012 and the Annual Intervention Plan, aimed to enhance and promote the region worldwide. This initiative includes three international stages located in three different countries: Canada, United States of America and Cuba. The project is devised by Maria Loscrì, President of Vibo Valentia Unesco Club and Medexperience, and will be realized by, Rosario Chimirri Professor of Architectural History at DINCI, Università della Calabria, with the coordination of Nicola Pirone, Director of “Calabresi Nel Mondo” WebTv – www.kalabriatv.it. 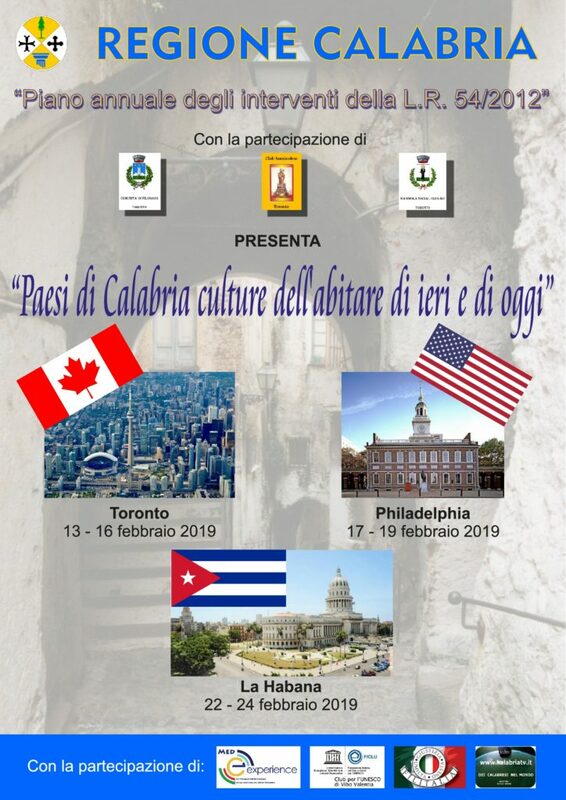 These three events will be realized with the collaboration of Associazione MedExperience, Unesco Club, Filitalia International Chapter of Vibo Valentia and KalabriaTV. This is not a random choice, since Toronto is the land of Calabrese immigration, as well as the site of three partner organizations, and Philadelphia is the headquarter of Filitalia International, a non profit organization founded by Dr. Pasquale Nestico, a popular cardiologist of Calabrese heritage. Moreover, L’Avana is linked with Calabria through a particular devotion to St. Francis of Paola, Patron Saint of Calabria. For this reason, the exhibition in L’Avana will be dedicate to this prominent figure and the 500th anniversary of the capital foundation. About the event: The temporary exhibition, realized through multimedia and self-supporting panels, includes a two-volumes “Paesi di Calabria – Settlements and dwelling cultures”, published by Rubbettino, 2017. It will be shown an interpretation of typical Calabrese settlements with a multidisciplinary perspective, by tracking the cultural, historical and architectural evolution, from the Middle Ages to modern times, with a deeper insight of different ways to conceive locations linked to life-style. The purpose is to enhance knowledge and appreciation of beautiful landscapes and monuments in Calabria, by carrying not a simple container of masterpieces but a masterpiece itself. Since this is an exhibition on historical villages, a very topical subject, we believe this event is relevant, powerful and exciting because the content includes a large number of residential areas in Calabria. In particular, by seeing several types of vicoli, streets, courtyard, we will be able to enact the memory of our guests and engage them with their distant origin.